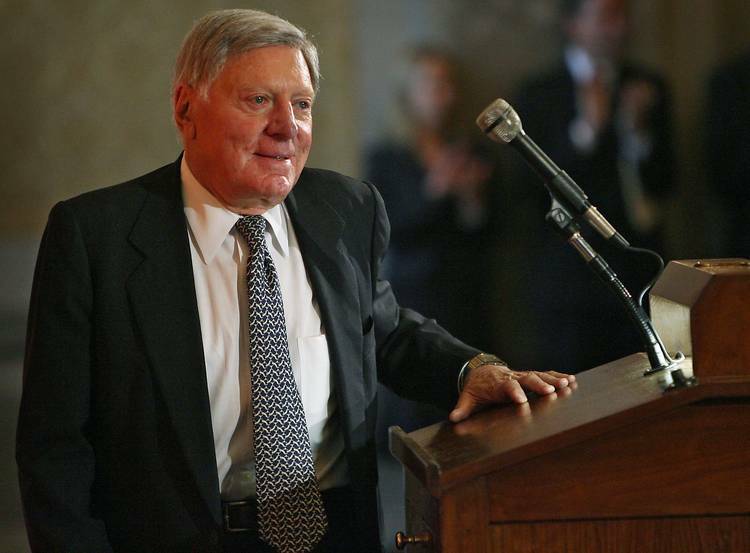 Joe Jamail, a towering figure in Texas courtrooms known for his swearing, swash-buckling style, died early Wednesday from complications with pneumonia, according to multiple University of Texas officials. The outspoken lawyer, who loved a good argument as much as his Texas Longhorns, was 90. In addition to being one of the greatest trial lawyers in American history, Jamail was a major benefactor to the University of Texas, both on the academic side as well as athletics. The Lee and Joe Jamail Texas Swim Center is named in his honor. The Longhorns’ football team plays on what’s known as Joe Jamail Field inside Royal-Memorial Stadium. In one of his last interviews with the American-Statesman, Jamail acknowledged the passionate Texas fan base. “You’re asking me why Texas fans are upset?” Jamail said in a story about then-athletic director Steve Patterson. “I represented Darrell Royal, and fans have been upset long before that. “His contributions to the University of Texas are a lasting legacy and testament to his never ending quest to give back and support activities, the law and sports he believed in,” Perrin said. “Our heartfelt condolences go out to Joe’s family. With them, we share grief and a sense of loss in his passing. But, we also share our joy of having had him as a major part of so many lives. “Joe Jamail was one of the first people I had a chance to talk to when I came to Texas, and I enjoyed our numerous conversations after that. I was in awe of his story and how hard he worked for everything. I also found out right away that he loved Texas and always wanted what was best for this program. He was a loyal Longhorn supporter and became a good friend. “I loved it because he was brash, confident and never ran from anything. He wore his feelings on his sleeve, but he also was a guy that cared about everyone and would help anyone in need. “Joe’s passing is just devastating news. First and foremost, my thoughts and prayers are with his family. I don’t know where to begin with Joe. Since we came to Texas 18 years ago, he’s been a friend, mentor, confidant, advisor – he’s been everything to me. He and Coach Royal were two of the most influential people in my life and having lost them both now is so difficult. Next story: Was Joe Jamail the ‘greatest lawyer who ever lived’? Was Joe Jamail the ‘greatest lawyer who ever lived’?